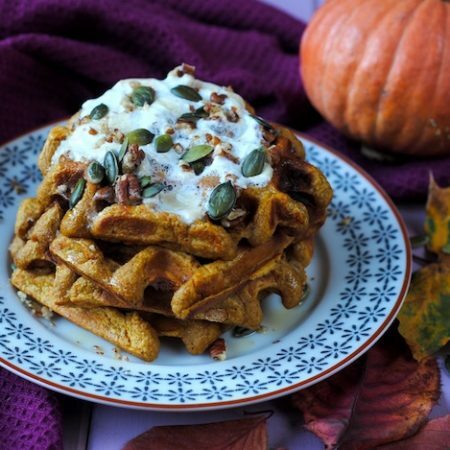 Make your kitchen smell of autumn as soon as you wake up with these Pumpkin Waffles. 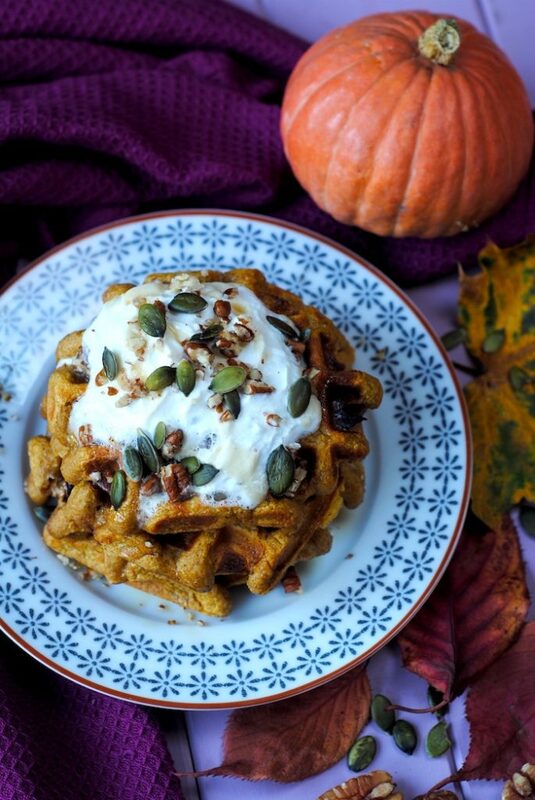 Full of autumn spices like cinnamon, ginger and nutmeg, these waffles will make you want to get out of bed on a cold morning. 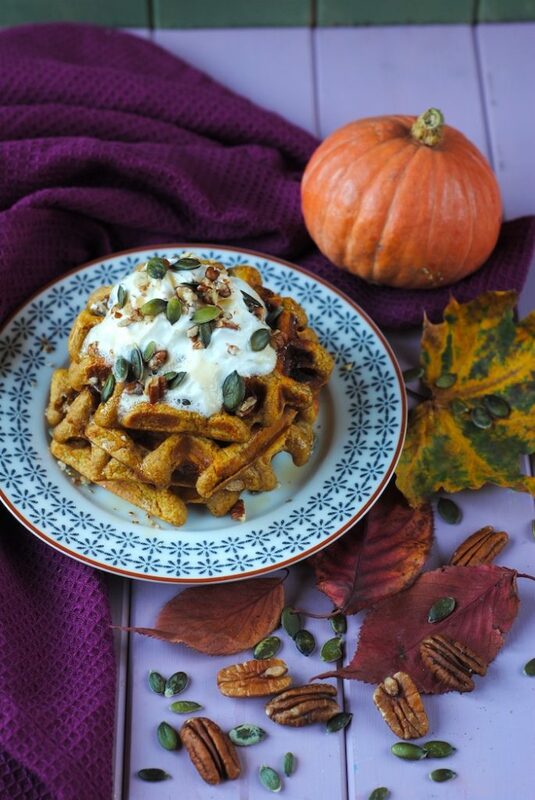 We are well and truly in to pumpkin season at the moment and that means even starting the day with pumpkin. Don’t just keep your waffle maker at the back of the cupboard – get it out and make a breakfast that tastes far more indulgent than it actually is. A lazy Sunday morning, or even a busy Monday morning (as these are so easy to make) is just made for waffles. You can tell that we stocked up on cans of pumpkin puree when we finally found some in the supermarket, as we are finding so many ways to use it. 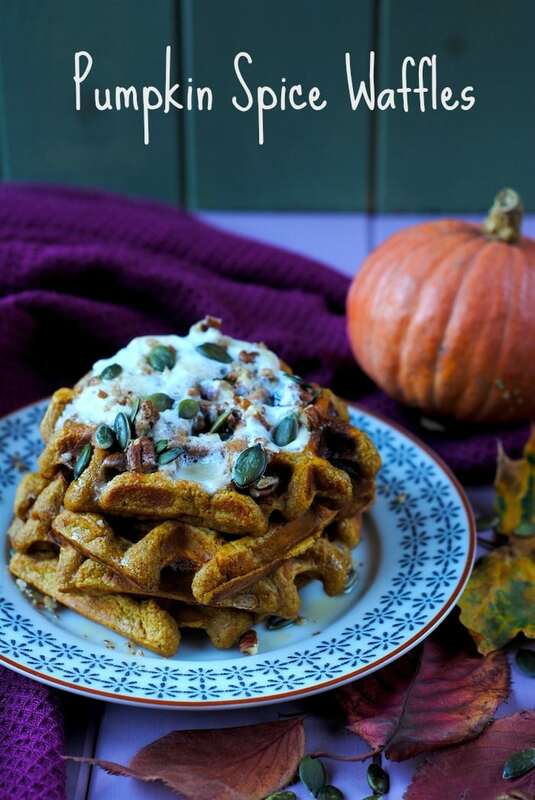 We used our reliable basic waffle recipe (that uses oat flour), which can be found in the Hungry Healthy Happy Book, and adapted it a bit to include pumpkin puree and all those aromatic spices. We just think that pumpkin and pecans are a match made in heaven, so even though we have just scattered some on top of these waffles, feel free to chop some up and add it to the mixture before cooking. I feel like we seriously missed out by not doing that the first time. You live and learn though, right? It seems to be our aim at the moment to build up a whole repertoire of waffle recipes. We have this vision of Sunday mornings being waffle mornings when baby is a little bit older and can help in the kitchen. What we imagine that to be like and what the reality of that being are probably very different. If we are being realistic, it probably involves a screaming toddler who 5 minutes previously did want waffles, and now no longer wants waffles and there is waffle batter all over the kitchen walls. But, for the moment, we can imagine that it will be a peaceful Sunday morning eating waffles round the breakfast table as a family. Waffles have such a reputation of being an indulgent dessert, and whilst they can be (I remember these waffles I would make myself at the breakfast buffet in Mexico – chocolate chip waffles stacked high and drowned in whipped cream, dulce de leche, more chocolate chips and some chocolate syrup), they don’t have to be. 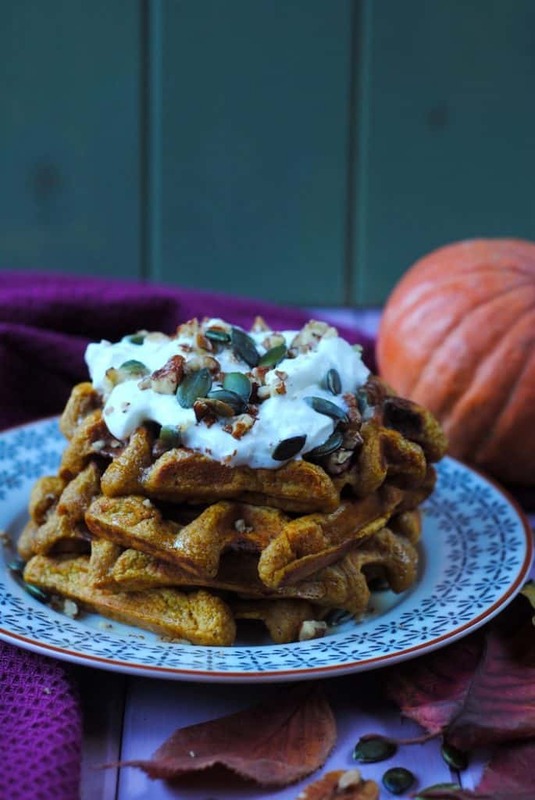 Using oat flour basically means these or porridge oats in waffle form. We use a banana to sweeten them (apart from a little maple syrup added on after) and greek yoghurt instead of butter. Just a few small changes take this from a calorie busting breakfast to a lighter option that is just 275 calories. 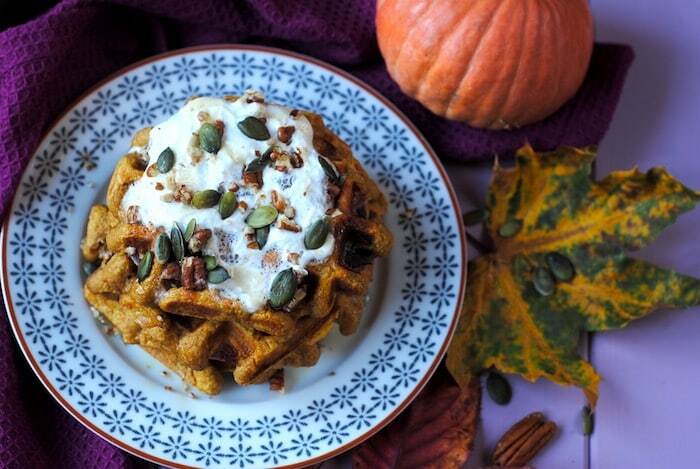 Do you want to be kept up to date on more delicious posts like these Pumpkin Waffles? Please subscribe to the blog mailing list (it takes 30 seconds). 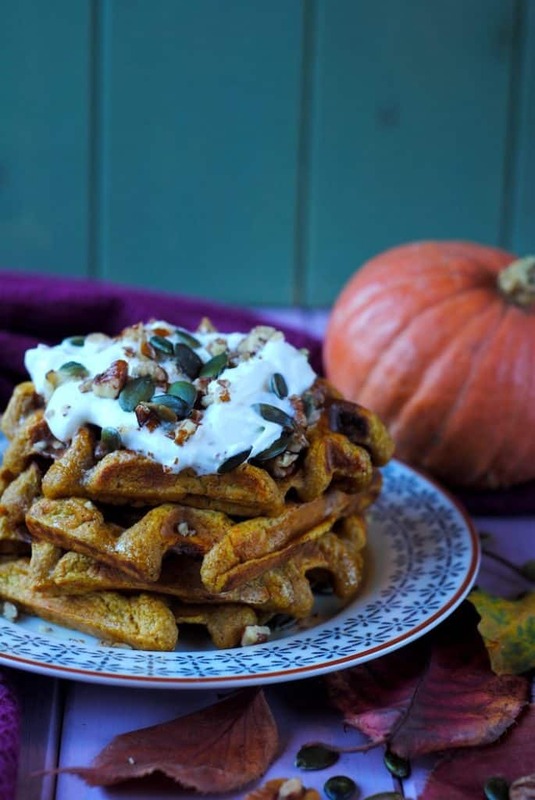 If you’ve tried these Pumpkin Waffles, or any other recipe on the blog, then let us know how you got on in the comments below, we love hearing from you! You can also FOLLOW US on FACEBOOK, TWITTER, INSTAGRAM and PINTEREST to see more delicious recipe ideas, behind the scenes shots and also what we are getting up to. 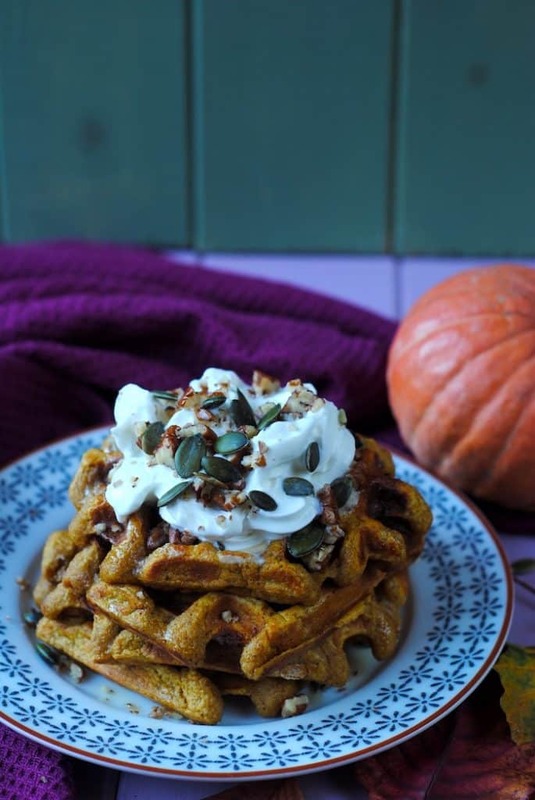 Full of autumn spices like cinnamon, ginger and nutmeg, these Pumpkin Spice Waffles will make you want to get out of bed on a cold morning. In a large bowl, add the oat flour, baking powder, salt and spices and mix. In a food processor, add the rest of the ingredients and blend for about 10 seconds. Pour the wet mixture in to the dry and mix well. Grease and heat your waffle maker according to manufacturer's instructions and divide the batter mix between the sections - this recipe will make 4 square waffles. Close the waffle maker lid and cook for around 5 minutes, depending on your waffles maker.